Chomp Inc. invented the first "candy" for pets and by doing so opened a new door for giving pets the same treatment people enjoy! Chomp's innovative candies include "Yip Yap" mini bone shaped breath freshening mints in a tin for dogs, "Sniffers" round and chewy beef or chicken and cheese bites in a candy pack for dogs and "Pit'r Pat" fish shaped "candy" in a tin for cats. 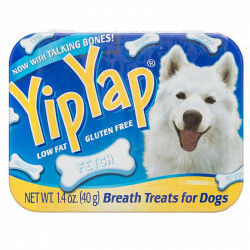 Chomp's wholesome, healthy, bite sized Yip Yap treats are made to freshen and renew your pet's breath, making doggy kisses no longer a thing of terror. 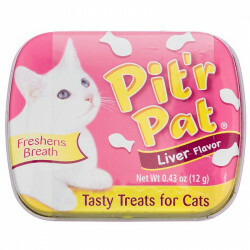 Likewise, Pit'r Pat treats for cats are fun, fish shaped breath freshening snacks that your cat will love to munch. Provide your pet with Chomp fresh breath treats regularly to help maintain optimum oral health and wellness. Be sure to browse all of our Chomp pet products to make sure you find just the right breath freshening treat for your dog or cat. Pet Mountain is pleased to be a leading vendor of great Chomp pet products. Pet Mountain is proud to offer you a wide selection of Chomp pet products, at the very best prices available anywhere! Take a look at all of our huge selection of great deals! Can't find something you're looking for? Let us know! We'd love to help. Be sure to check out our online coupons and discount shipping on all your favorite products.